Ever since the 1st Edition was published in 2012, this book has been a favorite of instructors who want to teach their students SQL querying and database design using today’s most popular DBMS for web applications: MySQL (or its fork, MariaDB). Now updated to MySQL 8.0+, this book is a perfect fit for career-oriented curricula…all at a great student price! Want to teach C++ in a way that works better for today’s students? Then this is the book for you! It takes advantage of modern C++ features to help you get students started with the language more quickly and easily than ever before. Then, it lets you build out their skills to the professional level, with coverage of structures, enumerations, the STL, OOP, pointers, generic programming, and more! Popular with students and instructors alike, our HTML and CSS book is now in a new edition that covers Flexible Box Layout and Grid Layout, CSS3’s latest modules for page layout and Responsive Web Design…shows how to use the Brackets text editor…introduces 3rd-party web development tools like Bootstrap…and is updated and improved throughout to help you deliver the professional skills your students need today. Hope you’re aware that we are now using VitalSource eBooks, which has set the industry standard with its Bookshelf readers for computers and mobile devices. That means that your students can now get their books on the first day of class, and access them both online and offline. We especially like using Bookshelf offline on a desktop or laptop computer because it lets you display our “paired pages” side by side. In fact, for the first time ever, we like our eBooks as much as our print books. To see for yourself, please request a free eBook exam copy today! Today, our books are not only used by developers in Fortune 500 companies, but also by more than 680 universities, colleges, technical institutes, community colleges, and high schools. What’s more, the same book that’s used by a community college or technical institute is often used by a college or university program too. Sound impossible? Take a few minutes to learn more about us. Then, request a free review copy of one of our books to see for yourself how well they work! This is our site for college instructors. 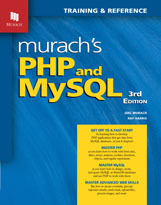 To buy Murach books, please visit our retail site. This is our site for college instructors. Please use it to review our books and courseware for possible adoption. About 15 years ago, we realized that there was something patently wrong with all textbooks, including ours. The problem was that students had to dig out the skill-building information that they needed from pages heavy with text. Then, to review or use that information, they had to dig it out again. That’s when we developed a new presentation method that we now call paired pages. With this presentation method, all of the subject matter is broken down into manageable chunks, or topics, that can be presented in a two-page spread. In each spread, the right page is a figure that contains the critical syntax, examples, and bulleted guidelines; the left page is text that gives perspective and extra explanation. One benefit of this format is that it lets students learn faster because they don’t have to read as much. To test that, just compare a topic in one of our books with the same topic in a competing book. You may be surprised at how efficient our treatment is. The beauty of this format is that it makes it easier for your students to review what they’ve learned; all the details are right there, on the righthand page. That helps them prepare for tests, of course. But it also helps them do the exercises and projects more efficiently because they can easily refresh their memories. And that really helps them learn faster. Another benefit of our “paired pages” is that they are the ideal reference format. That helps students work faster and better in lab because they can quickly review how to do something by going to the right-hand page that presents it. Contrast that with the traditional textbook in which the critical skills are buried in the text. Or, worse, the needed information is buried in a tedious, step-by-step procedure that presents new information that isn’t in the text! The exercises for our books give students a chance to get valuable, hands-on experience without wasting any time. That’s because we provide the starting code. That way, the students don’t have to enter the routine code that they already know (that is, the code that any professional is going to copy from an existing application or template). In the early chapters, our exercises guide the students through the application of what they’ve just learned. Later, they challenge the students to apply what they’ve learned in new ways. But always, our exercises force the students to practice the skills that they need to build real-world applications. As we see it, that’s the only activity that helps students achieve the most important objectives of a course. Beyond that, our exercises never introduce skills that weren’t already presented in the chapter. As a result, students don’t get confused by trying to apply skills they haven’t yet been taught. And they won’t have to search through the exercises later on, to find where the information they need is buried. All of the books that we sell are not only used for college courses but also by corporate trainers and by IT professionals who use our books for self-instruction. That’s testimony to the fact that our books actually teach the skills that are needed on the job. As all students and instructors know, traditional textbook publishers charge outrageously high prices, even though they don’t produce the best textbooks. In contrast, Murach books are always fairly priced...usually around $50. That means that more students buy the print editions of our books so they get the maximum benefit from our books. Instructors also tell us that many of their students keep our books after the course is over because they know our books will be valuable references on the job. If you’ve read “Why students learn more from Murach books,” you’ve seen some of the reasons for reactions like these. But briefly, our books present their subjects in a way that gets students doing productive work right away, delivers real-world skills, and gives them confidence that they know what they’re doing. In short, our instructor’s materials make it easy to switch from the book you’re using to our book. You just select the instructional components that you want to use, and you’re on your way. The end-of-chapter activities in our books include exercises that force the students to apply what they’ve learned in different contexts. 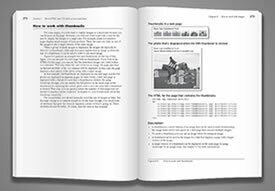 The student download for the book includes the partial applications that the exercises start from. It also includes the solutions to the exercises. That way, the students won’t be frustrated and delayed by the trivial mistakes that are common to novices. In contrast, the instructor’s materials include extra exercises and projects, and only the instructor gets their solutions. These extra exercises are similar to those in the book, but they provide less guidance and some are more challenging. As a result, our extra exercises and projects can be used to give the students more practice. But they can also be used to test whether the students have mastered the critical skills of a course. And that, of course, is the only true test of a student’s competence. Unfortunately, many programming textbooks today are so “dumbed down” that they don’t present the skills that are needed on the job. The other extreme is books that are concept heavy, but application light...often with toy applications used for examples. In contrast, the content for each of our books is selected based on an analysis of the skills needed on the job. To that we add the concepts and theories that underlie those skills. Then, we illustrate the concepts, theories, and skills with complete, real-world applications. The obvious benefit of this approach is that your students learn useful skills. The less obvious benefit is that it motivates your students because they always see the relationships between the concepts and the real-world applications. In contrast to other books, ours are designed and developed by a small group of writers and editors. As a result, we can and do coordinate the structure and contents of our books so they work together in a curriculum. Our Beginning Java books can be used in a series with our servlets/JSP book to teach students how to develop web applications in Java…or with our Android book to teach mobile programming. Our two C# books (one on core C#, the other on ASP.NET) can be used together to teach students how to develop web applications with ASP.NET and C#. Our SQL books on SQL Server, Oracle, and MySQL can be used in combination with any of our programming language books to build out your students’ database skills. This is our site for college instructors. To buy Murach books, please visit our retail site. © Copyright 1998-2019 Mike Murach & Associates, Inc. All rights reserved.